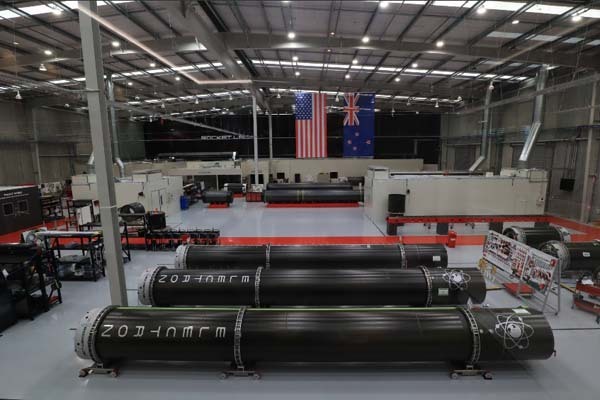 AUKLAND (Rocket Lab PR) — Rocket Lab has expanded its global footprint with the unveiling of a new production facility that rethinks the way orbital rockets are built. The new 7,500 sq/m (80,700 sq/ft) rocket development and production facility in Auckland, is designed for rapid mass production of the Electron rocket. Adding to Rocket Lab’s existing production facility and headquarters in Huntington Beach, California, the new facility brings Rocket Lab’s manufacturing footprint to more than 4.5 acres and enables the company to build an Electron rocket every week. “Every detail of the Rocket Lab launch system has been designed to provide small satellites with rapid and reliable access to space. This requires the ability to manufacture launch vehicles at an unprecedented rate, so we’ve expanded our global production capability to build and launch an Electron rocket to orbit every week,” said Mr Beck. Electron launch vehicles undergo final assembly at the new Auckland facility, where all parts go through a streamlined process for testing and integration into the rocket before launch from Rocket Lab’s private orbital launch pad, Launch Complex 1, on the Māhia Peninsula.